Junk Re-Thunk: Amazing Creations You Can Make from Junk! Henry Holt and Co. (BYR), 9781627791335, 80pp. 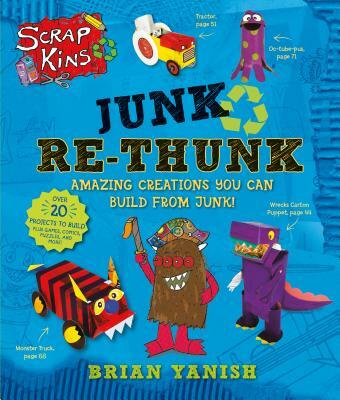 A monster-themed activity book about recycling trash into toys and art projects! Welcome to Scrap City, home of an inventive tribe of creatures called ScrapKins. Using materials that people throw away (empty soda bottles and cans, milk cartons, cereal boxes, and bottlecaps) these creatures make new things that are useful—the ultimate recyclers. With character profiles of the ScrapKins and instructions to make all kinds of puppets, instruments, and toys out of everyday items, this activity book (also featuring mazes, word scrambles, and comics) fosters creativity and encourages eco-friendliness. Brian Yanish has worked for Jim Henson Productions, trained as a special effects moldmaker, written and performed comedy, designed educational programs, and developed products for major children's brands. In 2006, he created the ScrapKins, an eco-friendly character property for kids based on his childhood drawings about a group of creatures that live in a recycling center and build their world out of the things people throw away.